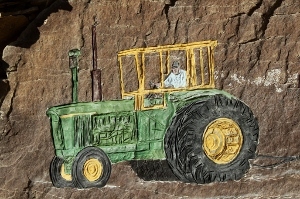 Artist Kevin Sudeith has renewed the most antiquated art, carving petroglyphs, and infused it with contemporary life. 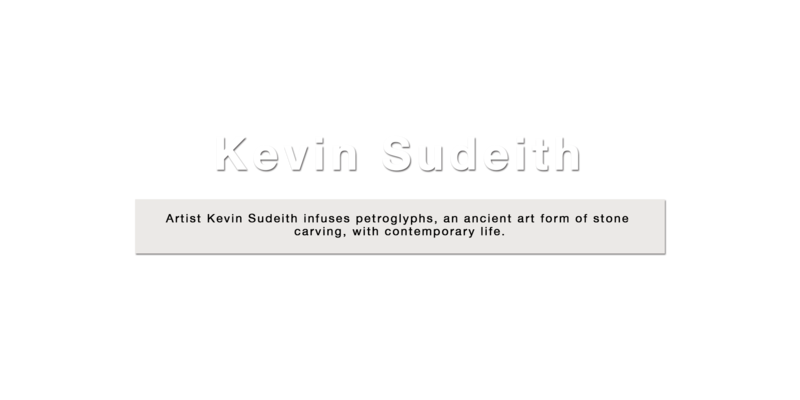 Kevin Sudeith is a Minnesota-raised and New York-based artist with a masters degree in painting and a longtime fascination with rock art. 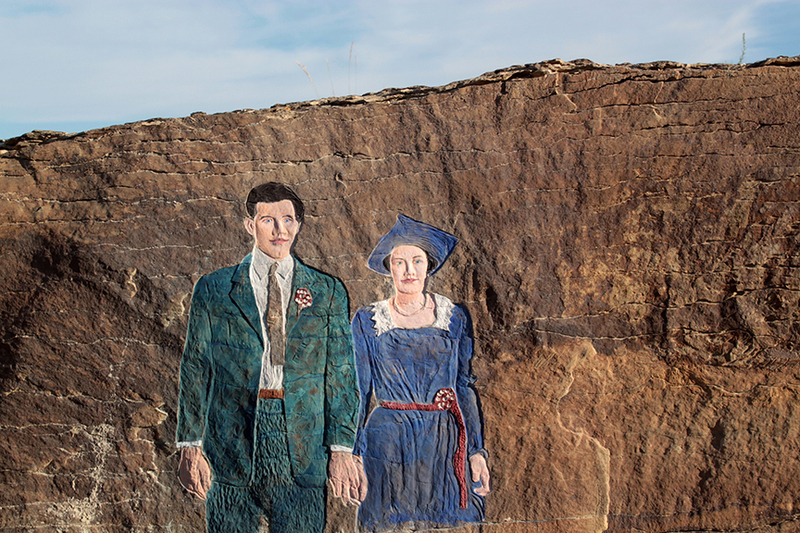 Since 2007, he has carved his way across North America, living out of his van, depicting in stone the lives and stories of the people and places he visits. Ingomar, MT. These are the original European Settlers on this land. Sudeith's host's parents were married, and this photo taken, moments after his mother arrived from Czechoslovakia as a mail-order bride. They were married 50 years and had nine children. Eagle Rock, New Hope, PA. Tucked into the woods on the edge of a quarry full of hawks, vultures, wild turkeys, woodpeckers, and songbirds, this eagle announces his reemergence after a long absence from the area. Fish Rock, Smelt Brook, Cape Breton, Nova Scotia. 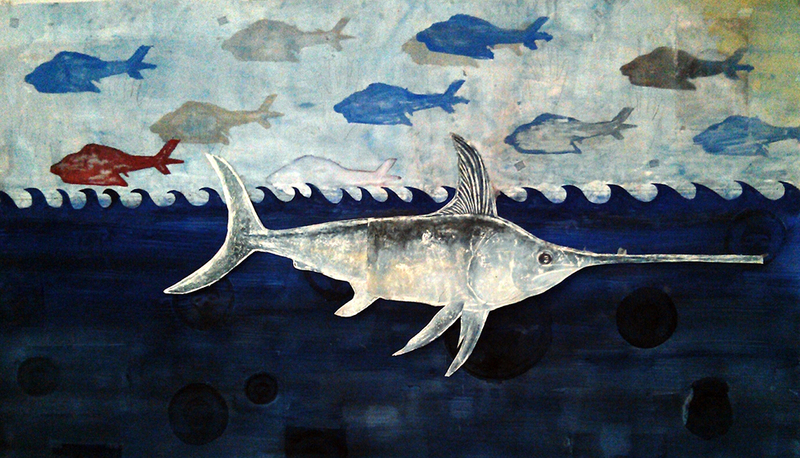 Life-size images of the species of fish landed in this small fishing community come from the stories of local fishermen. Smelt Brook, Cape Breton, Nova Scotia. The lobster season in Canada is short, by law, making the bounty highly prized. Morris, Ingomar, MT. A working cowboy at the end of a long day pushing cows. Big Moose, Smelt Brook, Cape Breton, Nova Scotia. Cast adrift for weeks in Cape Breton, Sudeith stopped to ask strangers where he might finds some carvable rocks. A few beers later, Sudeith's new host, Ray Briand, had agreed to let him carve this moose on a rock in his yard. 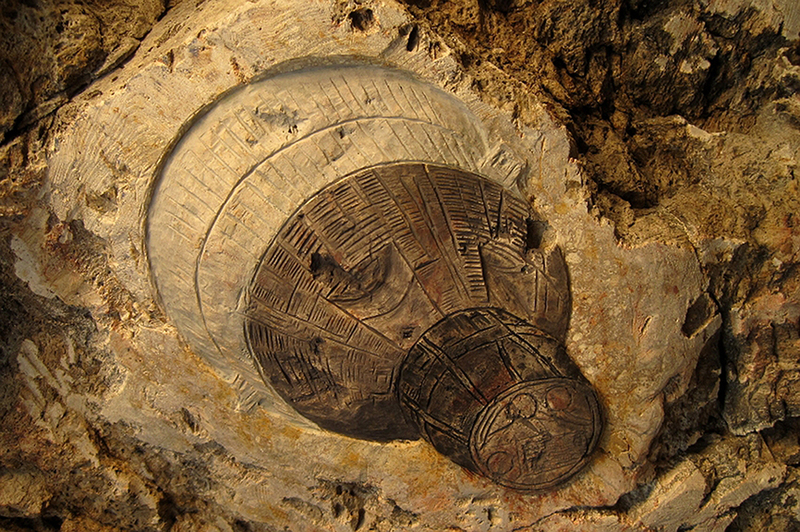 A lobster boat appears on the reverse side, facing the cove. Aerospace Frieze, Berkeley, CA. A moonwalker from the Apollo era floats upside down amidst the ISS, HST and a Gemini capsule; all of which float over a Bay Area frieze featuring ships, sailboats, and BART. Aerospace Frieze, Berkeley CA. This capsule with its triangular shape ties the Aerospace Frieze above it to the Bay Area Frieze below it. From Berkeley, California to Cape Breton, Nova Scotia, Sudeith’s travels have brought him in touch with communities both small (Ingomar, MT, Pop: 8) and large (Grand Rapids, MI). He works by invitation from friends and people he encounters on the road. His work explores the local culture, industry, and environment. From his petroglyphs Sudeith makes a unique sort of work on paper called an impression. 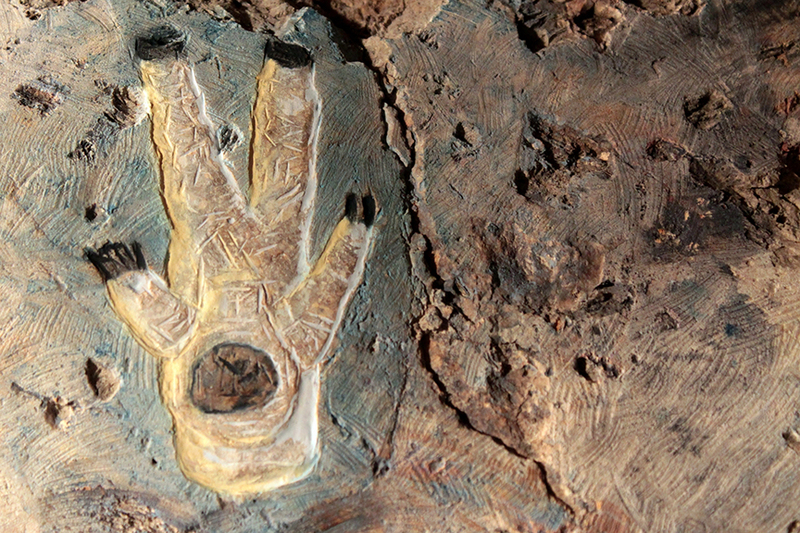 Wet paper, or in some cases paper pulp, is pressed over a freshly-painted petroglyph, creating a colorful, embossed negative—a sculpture in paper. Impression made from petroglyph to the right. 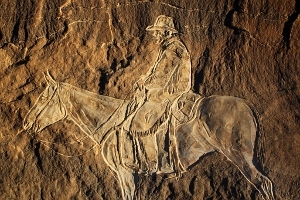 Petroglyph carving ready to make impression. Pumping jack from Kenmare Petroglyph which is in the Bakken Shale and surrounded by oil wells. Later, in his studio, Sudeith prepares collages from paintings, photos of carvings, impressions, and stencils made from impressions. 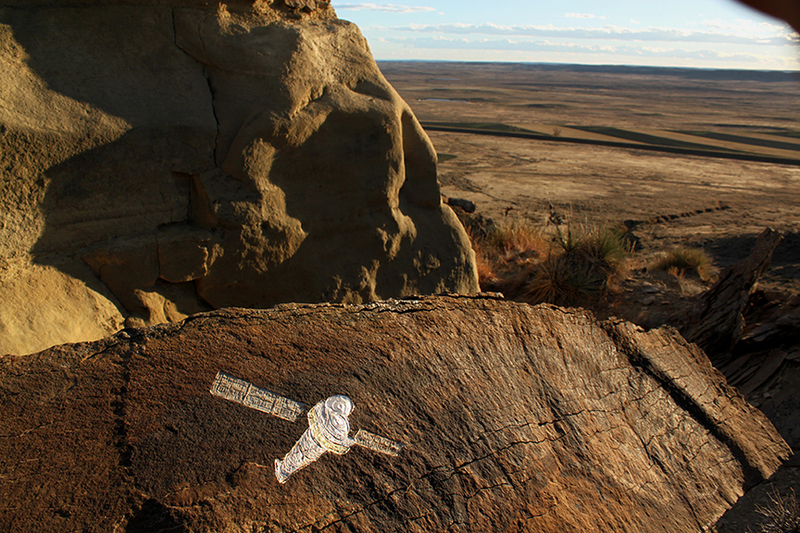 His goal is to inculcate the spatial relationships between the remote petroglyphs and the local works on paper. Collage prepared from photos of Sudeith's Emblem, stencils of a NYC police helicopter carving, and a swordfish impression. 5'6"x8"
This hand made paper impression of the swordfish and halibut was made on one giant (10'4"x7'2") sheet of paper that had to be cut to get it off the rock. 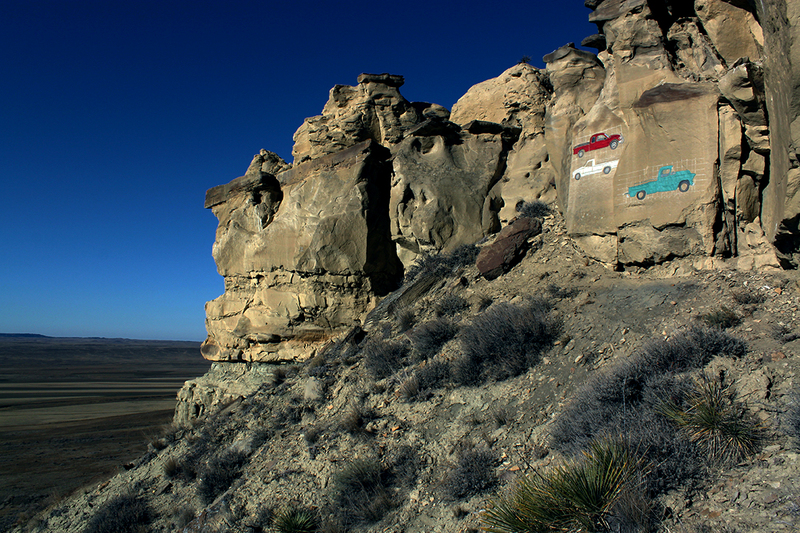 Sudeith's petroglyphs are presented through an array of media: impressions, collage, photography, a database, and time lapse video. 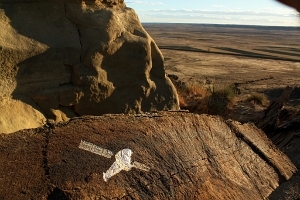 His videos docuement both the creation of the imagery as well as Sudeith's physical presence at the petroglyph site. The videos are designed bo be viewed briefly, like here, or slowly in a gallery space. 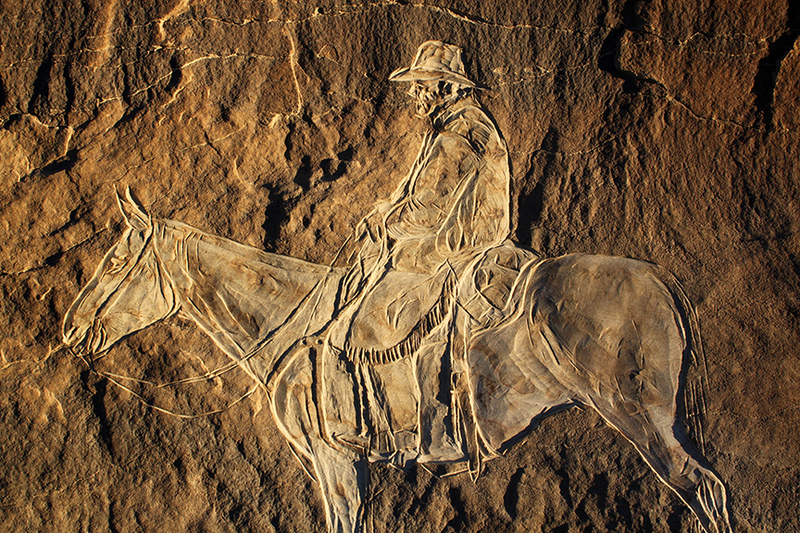 "Mr. Sudeith used chisels and battery-powered tools to create bas-relief renderings that exhibited perspective, depth and detail. Even a small carving could take up to a week to finish. He worked even in cold weather, and at one point contracted a bad case of poison ivy, and he loved it all." "It's a question that obsesses artists, and many of the rest of us for that matter: how to make something that will endure, that will outlast the creator, that will keep his or her name on people's lips for years, perhaps generations, to come? Kevin Sudeith may have come up with the answer: Create your project out of rock." 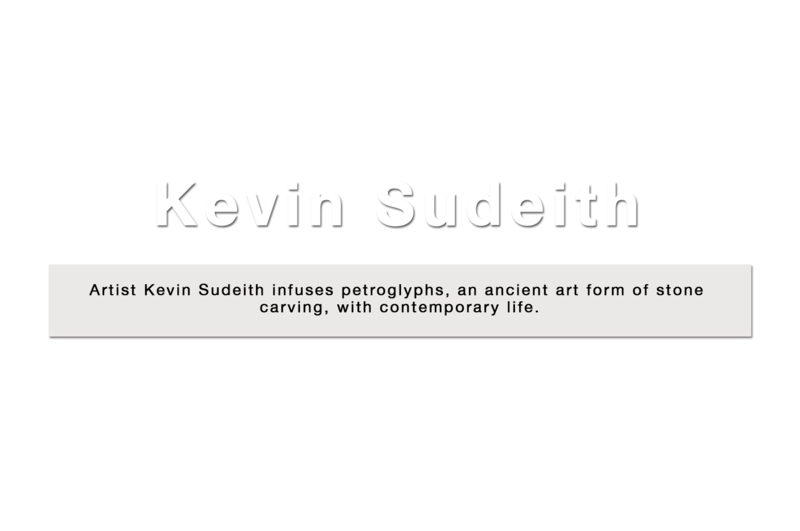 "In a world exceedingly characterized by high-speed technology, virtual reality, and surveillance, Sudeith’s carvings of human narratives — of human struggles and rewards — unfold slowly, both in their making and in that they’re meant to be discovered rather than exhibited. The narratives on stone beg to be touched and felt, but for the most part are hard to access. 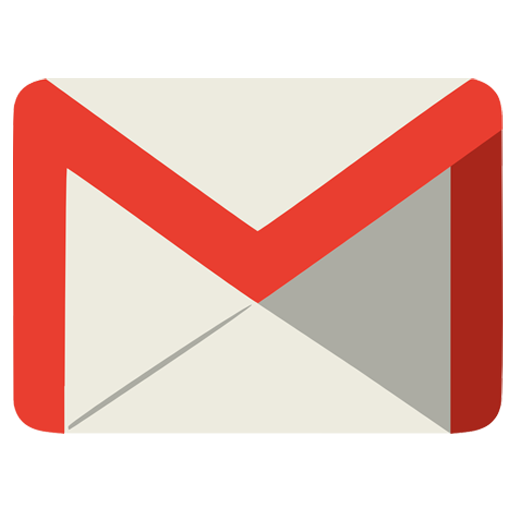 The relative inapproachability of the works collides with an art world that believes it can access (and acquire) everything at its fingertips." "Sudeith is working in what is perhaps the most archival artistic medium available to humankind: stone carving"
WNYC by Carolina A. Miranda. The Daily by David Knowles. Contra Costa Times by Doug Oakley. Kenmare News by Caroline Downs. Website design by Akil Grant.